At Linton Spine & Joint Chiropractic Center, we offer a broad range of treatment options and services to our Mt.Sterling patients. Dr. Linton and Dr. Tolson will work with you to identify which treatments will be the most effective and fitting for your specific needs. Exercise therapy is a critical component of chiropractic care because it supports the process of active rehabilitation after an injury. Exercise rehabilitation seeks to improve strength and flexibility, and restore range of motion in an injured area. Exercise therapy can also reduce stress and relieve muscle tension that can exacerbate chronic pain. Studies show exercise therapy, in combination with chiropractic care, can provide effective relief for back pain, neck pain, headache, migraine, and more. Whether you've been injured in an auto accident, at work, or on the field, or if you are simply suffering from ongoing pain, exercise rehabilitation can reduce pain and disability. 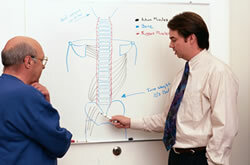 Dr. Linton and Dr. Tolson are committed to educating the public about how to treat and prevent musculoskeletal injuries. They provide trainings on a number of topics such as sports injury prevention in schools and auto injury case management for personal injury attorneys. With his certification in Colossus, Dr. Linton can teach attorneys how to use Colossus to add value to their cases as well as how to assess risk factors for injury and crash dynamics. To schedule a training for your group, please contact our office manager Dana, at (859) 499-1009.